The AOAC caters for all levels of mountain biker, though most of the organised rides are aimed at beginners to intermediate level. We have an emphasis on enjoyment, and try to ensure there is something for everyone. For the more experienced mountain biker we try to fit in descents, drop offs and climbs, technical single track and hair raising rocky horrors. For beginners and those wanting a more gentle ride, we use marked off-road cycle tracks or mountain biking paths, and usually stop for tea and cakes half way round. 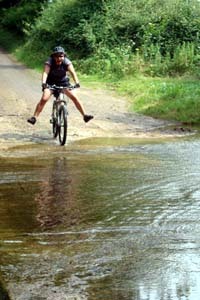 More extreme mountain biking trips are generally organised by keen individuals, getting together with like-minded people.